There are many reasons why one might reach for a tube of lip balm. Perhaps they are looking to add some color to their pout with a tinted tube, or maybe they crave some fruity- and/or minty-flavored taste near their tongue. But if I may be so bold, the most pressing reason anyone ever needs lip balm is to soothe chapped lips. And that is why Dr. Dan’s CortiBalm is the only lip balm that matters. I learned about Dr. Dan’s during my first winter living in New York City. Though I grew up in the very dry Mojave Desert, nothing could prepare me for how severely biting cold can dry out your skin. I’m a lifelong eczema sufferer, and my skin responded to the the Northeast’s cold air in kind. That is, my whole body turned red and itchy, maybe worst of all, my lips and the area around my mouth was chapped and flaky beyond belief, which was not only extremely uncomfortable but also not a great look. Wearing makeup became virtually impossible, and I spent pretty much every night slathering Vaseline all over my face and wondering why I hadn’t moved to Florida instead. 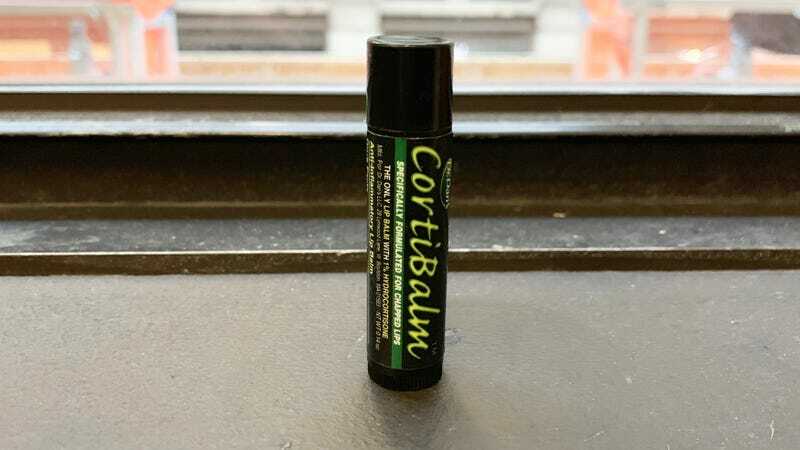 By the grace of the eczema gods, my cousin suggested trying Dr. Dan’s CortiBalm, a chapped lip remedy created specifically with people taking Accutane (a prescription medication used to treat severe acne that commonly causes very dry skin as a side effect) in mind. Desperate, I Amazon Prime’d a tube to myself that very day, and give or take a day later, my lips were well on their way back to normalcy. And — whaddya know? — the next time I visited my dermatologist, I noticed that they were selling Dr. Dan’s tubes up at the front desk, too. I felt seen. 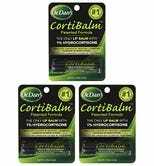 What sets Dr. Dan’s CortiBalm apart from other lip balms is the fact that it contains 1% hydrocortisone — a pretty standard of dose of an anti-inflammatory topical steroid that’s in a lot of anti-itch creams that you can buy over the counter at the pharmacy — along with a hypoallergenic blend of beeswax, petroleum jelly, mineral oil. And that’s it. No other chemicals or potential irritants. Dr. Dan’s claims to be the only lip balm on the market that’s imbued with the medicinal gift that is hydrocortisone, and let me tell you, it makes a big difference when it comes to healing your lips in the long run, as opposed to just providing a temporary fix. There is but a single downside to Dr. Dan’s, and it is that it does not taste good. In fact, it tastes bad (I see you, Burt’s Bees stans). But! We’re not putting on lip balm for cosmetic purposes, people! That’s what lipstick is for, and an off-putting taste is a small price to pay for flake-free, hydrated lips, amirite? Since that fateful first New York winter, I’ve bought countless tubes of Dr. Dan’s to keep in every purse I own, by my bed, in my bathroom, at my desk, and anywhere else I might regularly spend time. I’ve recommended it to many a fellow dry-skinned pal, all of whom have offered effusive thanks after trying it. And now, I offer the same recommendation to you, readers of The Inventory. Do your chapped lips a favor, and buy them Dr. Dan’s CortiBalm. Doctor’s (or, uh, my) orders.